Blasts rocked Brussels’ Zaventem Airport and the city's Maalbeek Metro station, killing at least 31 people and injuring over 250. Belgian media have identified the Brussels airport suicide bombers as brothers Khalid and Brahim El Bakraoui, while the third suspect, Najim Laachraoui, is still at large. The number of people killed in the Brussels terror attacks has gone down from 35 to 32 after three victims with dual citizenship were found to have been counted twice, the Belgian prosecutor’s office reported, according to Reuters. The National Security Council refused to reopen all metro stations in Brussels on Wednesday as had been planned, local media reported. The man detained on charges of “terrorist murder” on Saturday has been freed as there is no evidence to justify holding him, Belgium's federal prosecutor's office added. A man connected to the airport attacks investigation, named as Faycal C by Belgian police, has been released from custody due to lack of evidence, the Federal Prosecutor’s Office reported, according to Reuters. Belgium’s federal police have released CCTV camera footage showing a man at Brussels airport believed to be linked to the two other terrorists that blew themselves up in the check-in area last Tuesday. The man on the footage suspected of leaving the case with explosives and running from the terminal has been identified by Belgian media as self-styled freelance journalist Faycal Cheffou. The police may have difficulties with officially establishing the identity of the man, since he is wearing a hat and sunglasses on the video, a source close to the investigation told Reuters. The footage was provided with a police appeal for information. Brussels prosecutors have charged three more people with being part of a terrorist group, at the same time releasing a fourth person who had earlier been detained for questioning. In a statement, the federal prosecutors named the three suspects as Yassine A., Mohamed B. and Aboubaker O., and said they could not give further information at this stage, as quoted by Reuters. — Peter Spiegel (@SpiegelPeter) 28 марта 2016 г. The number of dead from last week’s bombings at Brussels Zaventem Airport and the blast at a city Metro station has risen to 35, according to the Belgian health minister, Maggie De Block. "Four patients deceased in hospital. Medical teams did all possible. Total victims: 35. Courage to all the families,” the minister said in a tweet. Three suicide bombers are among the 35 victims. — Communicatie (@Maggie_DeBlock) 28 марта 2016 г. 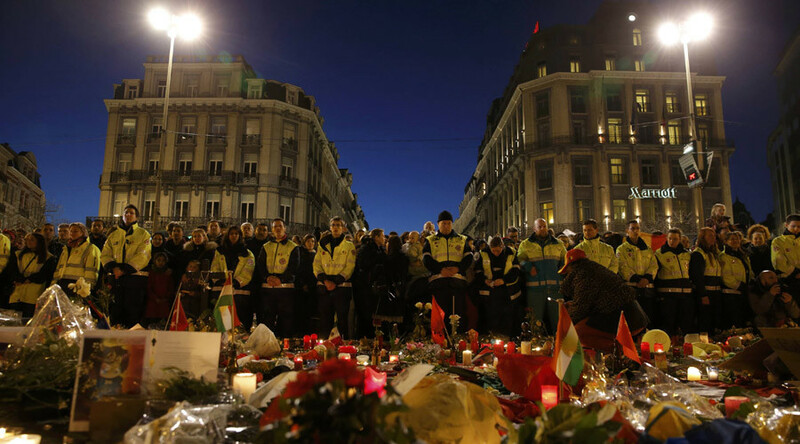 Police carried out 13 new raids in various districts in and around the capital Sunday morning as part of the ongoing investigations following the Brussels attacks, prosecutors said, according to RTL. A total of nine people were questioned "in the context of a terrorism file," Reuters reported. Five were later released. “No further details regarding the raids can be given at the moment,” the federal prosecutor's office said in a statement, however. Brussels prosecutors have charged another man with participation in a terrorist group, Belga reported. Prosecutors told the news agency that the suspect, identified as A. Abderrahmane, was being detained for a further 24 hours after being shot in the leg during a raid in the Brussels district of Schaerbeek.